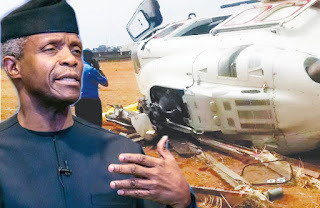 Details emerged on Monday on why Vice - President Yemi Osinbajo chartered a private helicopter for a trip to Kogi State last Saturday, which ended up crash- landing in Kabba. The VP, the Minister of State for Labour, Prof. Stephen Ocheni, and 10 senior presidential officials had escaped unhurt when the AgustaWestland 139 helicopter marked 5 N- CML and serial number: 31389, owned and operated by Caverton Helicopters hit the ground awkwardly and fell on its side at the Kabba Stadium in Kogi State on February 2. Two choppers in the official fleet , said to be the “only functional ones ” for now, had already been engaged to fly to presidential campaign venues in the North- East on the fateful day. Investigations showed that the VP’s office ruled out any sabotage in the near - death experience. “There is no use pre - empting the outcome of an investigation. However, there is no fear about any sabotage,” a presidential source told The PUNCH.